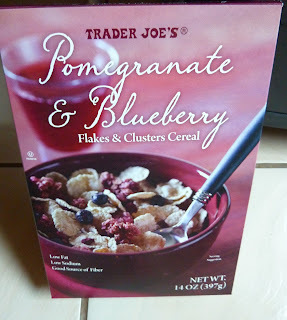 When it comes to Trader Joe's cereals, we've collectively only found one worthy of the Pantheon so far. And each half of the WG@TJ's team has found at least one offering that we can't wholeheartedly recommend, like the Twigs, Flakes, and Clusters or the Loaded Fruit and Nut Granola. This Pomegranate and Blueberry cereal is the only one in recent memory that falls right in the middle of those two categories. I highly recommend you try it if you're into pomegranates and blueberries, but I can't give you my personal guarantee like I might something in our Pantheon. The flakes are hearty, rigid, and very crunchy—even more than I expected. They're borderline "scrape up the roof of your mouth" style flakes, and they're surprisingly sweet, coated in what I guess is "milled cane sugar." There was a decided lack of blueberries in my box, which is unfortunate, because they were my favorite part of the cereal. They're dried and slightly shriveled, but they taste like lightly-sweetened real blueberries...because that's what they are. But the most pleasant surprises in the mix were the delicious crunchberry-esque wads of purplishness that I'm guessing are supposed to be pomegranate-flavored. To me, they tasted more like cherry, but either way, they were tasty. And yes, if you read the ingredients list, you'll note that there is both real freeze-dried pomegranate and cherry puree in this cereal. These lavender bunches crunch like clusters of granola, and they're both sweeter and more tart than you'd expect. 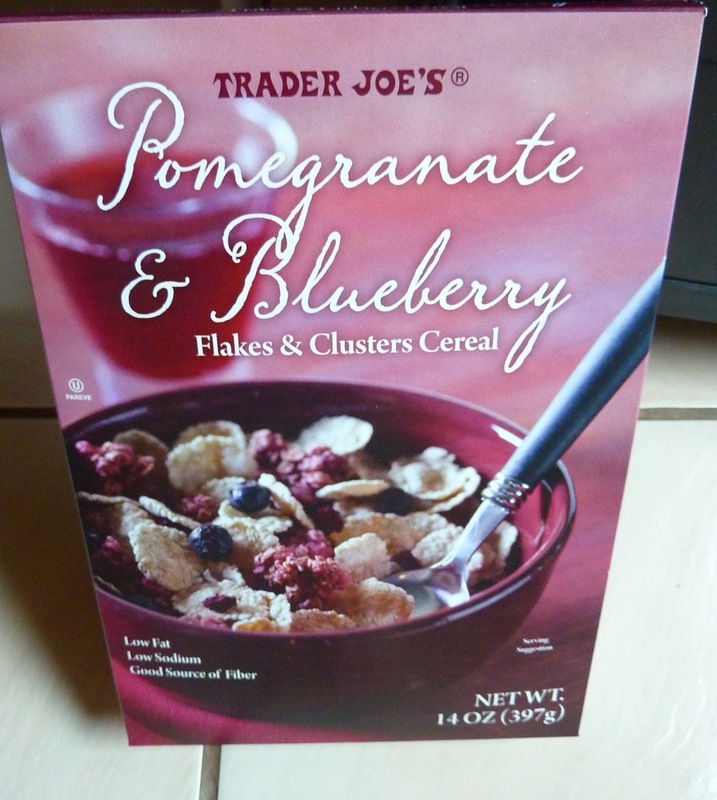 Plus, unlike the elusive dried blueberries, these fruity chunks were omnipresent in the box. The cereal stays crunchy until the end of the bowl, and while your milk won't turn super-purple, there are hundreds of flecks of dark blue floating around, and there's just enough sweetness to make it worth reliving your childhood, putting the bowl up to your lips, and chugging it dry. Sonia gives this cereal 3.5 stars. I give it 4. That's crazy. I have not had a TJ's cereal that I DIDN'T like yet. It's not that we didn't like them. It's just that only one or two really WOW'ed us. 6 or 7 stars/GoldenSpoons is a respectable score for us. We've made it our job to be critical of TJ's.